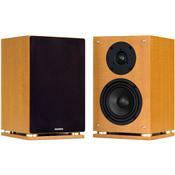 The SX-6 is highly accurate and intensely musical with wide frequency response and low distortion. New digital audio formats demand a new level of performance, these speakers are ready for them! With superb sound radiation and rich timbre, it converts the audio signal into incredibly wonderful music. Even at high volume levels the acoustic image remains free from cabinet vibrations and driver resonances so you hear all the music and only the music. The bookshelf design allows for multiple placement options. In home theater surround sound systems the SV-6 speakers produce exceptional sound and are suitable for operation as front main or rear surround speakers. By virtue of the rear-firing tuned port bass reflex venting system the SV-6 has outstanding and precise bass performance for its compact design. Only premium components such as Neodymium tweeters, rare in speakers at this price, and powerfully dimensioned high-performance magnets are used in the production of this system. The result is a pure and perfect listening experience. Thanks to its distinct design and premium natural beech finish, it harmonizes perfectly with modern living areas. There are people online (a few audio forums) that have not heard these speakers that say things like, "Fluance SX-6 are just white van speakers," "I bought the Pioneer SP-BS22LR and they are the best but I never heard the Fluance".... all kinds of crazy comments! They sound as good as speakers 2 to 3 times there price. The definition and layering in the sound is excellent and they sound great from all angles. The bass is rich and accurate but not overpowering. The high ranges are crisp and clear, not distorted, even at higher volume levels. None as far as I am concerned, these speakers are flawless, even if I had paid more for them. I was a bit worried about purchasing these speakers from an online only dealer, despite their excellent warranty and 30-day satisfaction guarantee. However, rest assured any and all doubts I had have been quickly brushed aside. The transaction was very smooth and quick and they came in perfect condition. a game, cd source, mp3 or movie, these speakers handle everything exceptionally. mention the fact that they are backed by a five year parts and labor warranty. that these fantastic speakers are offered at. Excellent, ordering was easy and they arrived quickly, considering they are coming from Canada. Excellent, ordering was easy and they arrived quickly, considering they are coming from Canada. Shipping was only 30 bucks. I bought the SX-6 pair for my son to take to college and use in his frat house room. I had looked at other bookshelf speakers in the "big box" stores (speakers like Polk, infinity, JBL, etc..) I just couldn't see spending that kind of money on something that might get beat up in the college frat house. I found these Fluance SX-6's on line and read a lot of good things about them. I decided for that price they are probably a good speaker for this purpose. They arrived promtly with no trouble. I was immediately surprized at the weight and the build quality. to be honest I was expecting less given the price paid. I tested them on my good NAD amp was quite impressed by the sound....very good, especially for the money. My son is not audio knowlegable but he loves them... especially when played loud. of my speakers was damaged. Fluance had the necessary parts in my hand within two days of my inquiring and the parts were delivered at a very reasonable price. This company is obviously here to stay. Smooth highs. Dead on midranges. Sturdy contruction. Visually appealing. Very little bass, but I'm being pretty nitpicky because they arent really meant to have bass with a 5" driver. Use good front speakers or a sub (or both!) if you want bass. I ordered the SV-10 along with the AV-SC center channel and the SX-6 bookshelf surrounds. The SX-6's are, to me, very impressive. I have them hooked up to an Onkyo 504 receiver with 75 watts per channel. I got these as an upgrade from a Logitech digital computer speaker system with 3" surrounds and a 10 in sub. Those were great for a while but I finally realized that the sound was unbalanced, so when I upgraded I decided to go all out with some of Fluance's higher end products. To start with, these speakers were larger than I had anticipated. When I opened the box I was thinking "wow." The construction is sturdy and the speakers look very nice with the black grills on. The 5-way binding posts are very handy and work great. I've given them the 15-20 hour break in period. The highs are not too harsh, and sound very good. This is where I can tell a big difference from the other speakers I've used. The mids are pretty much dead on, giving just enough low midrange to have a small thump and enough high mid to make guitar riffs sound really good. They have relatively no real bass because I have my receiver sending most all of the bass signal to my front speakers since they have the 8" woofers. Nevertheless, the SX-6's 5" midranges give the whole system a very balanced sound. Its nice having some surrounds that actually put out some good sound for watching movies. And boy will they get loud! They will not distort either, unless you have a poor quality source but then any speaker will distort. Also, combined with my front speakers they manage to make movie soundtracks sound like they are coming from 3 or so feet away from the front speakers to either side. That is a pretty cool effect to me and I assume it is due to having surorund speakers that are very well matched to the fronts. I use the speakers about 70% music and 30% movies. The music is almost exclusively rock. I've also tested them with rap although that's not what my usual listening is. With movies the sound is very immersive. I'm am not dissapointed in any sense with these speakers.Overall I am very satisfied with my purchase. I might even buy another pair to make a 7.1 setup in the future. Nothing similar but I'm comparing them to a a Logitech Z-5500 digital computer speaker system. These are quite an upgrade compared to the 3" surrounds I was used to. rich full-range sound... very spacious detailed and accurate. can not believe the sv-6s only sell for $119 unbelievable they sound absolutely beautiful. got them took them out of the boxes and hooked them up and they sound amazing. cant wait untill they break in. i want to also say fast shipping and great customer service. Harsh highs, shallow low-end and barely acceptable mid-range. Let me begin by saying that I used to own Fluance a while ago (before my ears were 'tuned' ). However now I have my newly-purchased Fluance speakers set up (all their "top-of-the-line" stuff). The setup consists of two SV-6s for the L/R channel and the AV-SC center channel speaker. The L/R speaker are almost perfectly placed at ear height and a 60 degree angle from the 'sweet spot.' I've let them break-in (I won't start this debate but I think it made a stark difference) and I've listened to them for a few hours with varying source material. Here is my verdict: They are worth every penny paid for them. Now this is a very loaded statement due to the fact that they cost virtually nothing. They are in a class unto themselves. There is no company that can compare at their prices. Ultimately I'll have their top-of-the-line 5 channel setup for under $300. Basically what it boils down to is that if you simply cannot afford a $1000 5.1 channel speaker setup there is no option that compares. That being said, I don't believe they are worth much more than they cost. Many have claimed that they are worth far more than their suggested retail. I'm here to say that they are not. They are barely tolerable with music. With movies generally I'm so engrossed in the film I do not critique the sound as much. With music the low end is shallow, the mid-range is present and smooth but not terribly precise and the highs/treble is harsh. But they shoot out big sound and its tolerable for the price. For a movie-watcher that is not an audiophile and who wishes to pump their money into other hobbies (travel, cars, etc) this is a perfect solution. That being said I do not regret the purchase. My father just set up a $2500 Ascend/Hsu system which absolutely BLOWS away this Fluance setup, there is literally no comparison. I can't imagine spending too much more than $2500 on a system... beyond that I can see quickly diminishing returns. Make sure you place them properly and they'll sound fine. Fluance is in a class unto themselves. I bought these speakers for my bedroom and they sound great . First off these sv-6s are made very well and look great. Now as for sound I've heard Paradigm Atoms, B&W's, and Mirages all these were bookshelf speakers and without taking away from them a thing, these sv-6s sound clear not harsh , very well defined. They also handle alot of innformation for a bookshelf. In additinon to this they disperse nicely with rich sound. Secondly I was impressed with the bass they prodice truly beautiful. The bass was accurate and vety present.If you want a pair of great sounding bookshelf for just about any application these will do and at the price can't be beat. P.S. all this after being broken in.